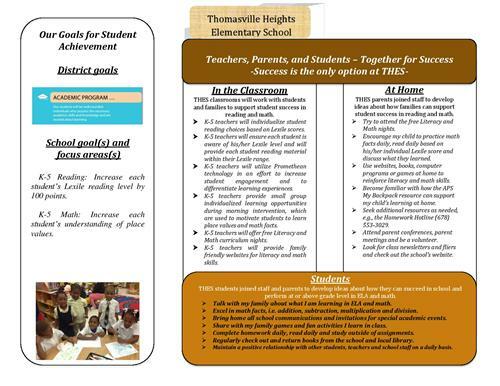 Thomasville Heights Elementary students participating in the Title I, Part A program, and their families, agree that this compact outlines how the parents, the entire school staff and the students will share the responsibility for improved student academic achievement. It also describes how the school and parents will build and develop a partnership that will help children achieve the State’s high standards. Students - Use weekly and monthly when they receive their progress reports, report cards and assessments to measure goals for student achievement designed by the school. Parents - Review weekly progress report data to school and District goals; measure success based on support and strategies for success laid out in the school wide plan; refer to the School-Parent Compact in parent teacher conferences, parent meetings, etc. Teachers and Staff - Review weekly progress report data to school and District goals to students and parents; measure success based on support and strategies for success listed in the school wide plan; refer to the School-Parent Compact in parent teacher conferences, parent meetings, etc. ; ensure student success in lessons by referring to student responsibilities; post to school’s website for access by families; provide to parents and guardians through the school’s listserv. Parent Liaisons - Make the School-Parent Compact available in the Main Office, Media Center and Parent Center; at all academic workshops, programs and events; on parent teacher conference days and provide information on the usage of the School-Parent Compact during faculty/staff trainings and meetings. Mrs. Ferrell at 404-802-5750 or via email at gmferrell@atlanta.k12.ga.us. We look forward to our school-parent partnership!